Bartolo Longo was the son of a doctor and a devout Catholic mother. He went through a crisis of faith in his university years as he studied to become a lawyer. He joined a sect and was ordained as a priest of Satan! He publicly ridiculed Christianity and did all in his power to subvert Catholic influence. A good friend, Vincent Pede, eventually showed Bartolo the gentleness of Christ and arranged for him to meet a saintly Dominican priest, Alberto Radente. The Dominican had a deep, personal devotion to Mary and fostered the devotion of the Rosary. Bartolo saw Mary as a “Refuge of Sinners” and attributed his own miraculous conversion to her. Now he wanted to do penance for his past life and serve the Church that he had so viciously slandered. He made a promise to work for the poor and destitute. St. Dominic and St. Catherine of Siena honor the Virgin Mary in a vision that healed Fortuna Agrelli. Bartolo began teaching the catechism, spreading rosary devotions, and holding Rosary Festivals with games, races, and even a lottery. From 1873 to 1875 he restored an old church, held an annual festival on the Feast of the Holy Rosary in honor of Our Lady of the Rosary, and obtained and restored a worn painting of Mary from a convent in Naples for this church. The large painting was tattered, torn, cracked, and “worm-eaten,” arriving on its back in a wagon of manure. Fortuna Agrelli, a very ill young girl suffering three incurable diseases that most doctors had given up on, was joined by her family in saying a novena of Rosaries starting on February 16, 1884. The Virgin Mary then appeared to her on March 3rd, sitting upon a high throne, profusely decorated with flowers. She held the Divine Child on her lap and a Rosary in her hand; both were clad in gold-embroidered garments. St. Dominic and St. Catherine of Siena accompanied them. Fortuna asked Mary — as “the Queen of the Rosary”—for a cure for herself. Fortuna did as Mary said and was completely cured. And this is how the Rosary Novena devotion to Mary originated. Many healings are attributed to Our Lady of Pompeii. Between 1891 and 1894, hundreds of miracles have been officially recorded at the sanctuary. The image of Our Lady of Pompeii represents Our Lady of the Rosary as Queen of Heaven. 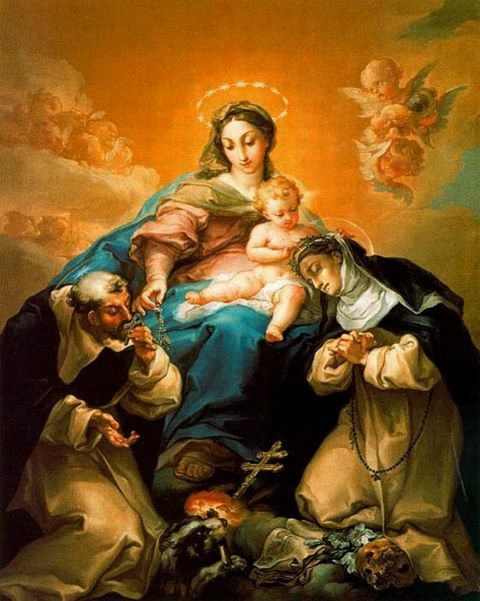 In the image she and Jesus are handing out Rosaries to Saint Dominic and Saint Catherine of Siena. The neoclassical pontifical shrine and Basilica of Our Lady of the Rosary of Pompeii, in all of its frescoed, marble splendor, was dedicated in 1891. This happened sixteen years after Bartolo Longo began to collect pennies from the peasants to build this temple to Blessed Mary. On October 21, 1979, Pope John Paul II visited Pompeii in a national pilgrimage to Our Lady of Pompeii. He beatified Bartolo Longo on October 26, 1980. Blessed Bartolo, a Third Order Dominican, founded the Sisters of the Holy Rosary of Pompeii. He established homes for the poor, for orphans, and for the children of people in prison.